What you are about to hear is not a fabrication. It is not an imitation. It is the ACTUAL LIVING VOICE of Leo Tolstoy, recorded in 1909 on one the very first gramophones ever to exist in Russia. Tolstoy believed that quality education should be available to everybody, not just to the priviledged few. That’s why he created a school for peasant children on his Yasnaya Polyana estate and helped to create libraries in his local community. The picture to the left shows Tolstoy at the inauguration of “The Library for the People” he helped to found at Yasnaya Polyana. Tolstoy died only a few months after this picture was taken. 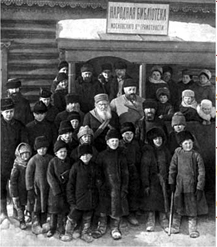 Listen in as Tolstoy teaches the peasant students in his Yasnaya Polyana School for the People.